The Super-i® Real Virtuality™ System uses algorithms similar to those used in professional image processing systems (such as Adobe Photoshop™) allowing you to view reality through effects such as: Invert color, Matrix, Psychedelic colors, Emboss, Inverted emboss, and Line-through. The heart of Super-i® is a microchip developed by the company that allows real-time video signal processing and effects. Other system components include a video camera with a "human" angle of view and a pair of high quality micro-displays. The system is assembled inside a pair of lightweight goggles and powered by standard AA batteries. The user can explore altered reality, easily and unencumbered. The Super-i® can also be connected to any video source (DVD-player, computer, game console, etc.) for more typical entertainment, viewed as if there's a giant screen in front of a viewer. 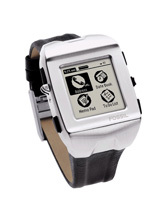 Fossil, Inc., a leading innovator of watch design and development, has launched the world's first Palm Powered© watch. The Wrist PDA™ with Palm OS™ provides a portable and stylish way to organize personal information. Customizable watch faces allow consumers to change their watch to suit individual style, while 8 MB of memory supplies storage for addresses, appointments, memos, third-party Palm OS™ applications and more. Additional features include a high density 160 x 160 pixel grayscale LCD with touch screen and backlight, a stylus cleverly integrated into the watch buckle, one-handed navigation, the ability to beam data to another Palm Powered© device via the Infrared Port, USB HotSync™ support, and a lithium-ion rechargeable battery that lasts approximately 3-4 days. The FOSSIL branded product, with stainless steel case and black leather strap, is priced at $249.00 USD. One FOSSIL Wrist PDA™ will be raffled off during the SIGGRAPH week in the Guerilla Studio. The eMagin Z800 3D Visor is a mobile gaming and entertainment accessory that delivers an immersive 3D computing experience. Users surround themselves with visual data: gamers can play "inside the action" and PC users can work in a borderless environment. Two high-contrast eMagin SVGA 3D OLED microdisplays deliver fluid full-motion video in more than 16.7 million colors. A highly responsive head-tracker drives the experience and provides a full 360-degree view. eMagin's specially developed optics deliver an image equivalent to a 105-inch movie screen viewed at 12 feet. The new helmet-mounted Liteye 500 can be used as a standard head mounted display or for augmented reality applications, with user-selectable see-through capability. Match a map to the road, a landmark's photo to the landmark itself, or overlay a drawing on the actual hardware. It's a high-performance, rugged package based on patented optics and an eMagin SVGA+ OLED microdisplay. Ultra-small mobile PCs can run full-featured operating systems and office applications using the eMagin eGlass. OLED microdisplays provide a full-color, high-contrast SVGA display for mobile computing, and accommodate a greater range of pupil movement to make extended data viewing easier. These near-eye display systems allow complete data privacy in the most public environments. The eGlass monitor even draws power through the USB port, saving on batteries. Handbags that warn you if you're about to leave the house without your wallet or if you'll need an umbrella for the day, and scarves that yell at their fellow handbag if they're about to be left behind on the subway, are all made possible by building with these fabric-based Lego-like blocks. Each of many modular, specialized, functional units of the Accessorizing with Networks project can be added in or taken away from the accessories as needed. For example, when running quick errands in the morning you might not include either of the modules that make your purse light up when it's opened in the dark or when your cell phone rings, but you can add those back when you might need them at night. “Medulla Intimata” is video-responsive jewelry created by internationally recognized video artist Gonsalvez and British engineer, inventor, and artist Donaldson. The project introduces a new form of non-verbal communication: a real-time generated video stream reflecting and commenting upon your conversations. The source video is drawn from a database of self-portrait video clips stylized to reflect various moods, and video sequences are selected by software that monitors the tone and intonation of the wearer’s voice. 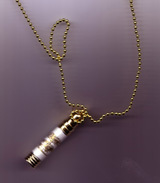 Then the video is broadcast to the jewelry using Wi-Fi technology. Real time effects, pacing and transitions are used to amplify or subvert the social moment, exploring how video can be made more intimate by embedding it in objects that have rich symbolic and cultural associations. "Medulla Intimata" has been supported by The Australia Arts Council, Arts Queensland, IAMAS, Artsway and co-produced with the Banff New Media Institute. Company Keeper has an antidote for every social inadequacy one may encounter in daily life. Once installed, its occupant enjoys the perpetual company of a wise, humorous and absurd friend, always ready with a custom cranial concerto, capable of neutralizing the occupant's nervous disposition. The wearer's mood is assessed by his/her body language (calculated with embedded touch sensors and an accelerometer in a hanging beaded tassel) and the level of sound in the environment (measured with a microphone). When moods such as wrath, awkwardness, and claustrophobia are detected, an antidotal soundscape is played through headphones in the hood. Emotional Ties takes its inspiration from the subtleties of the unsaid word. Male and female body language (preening) is monitored through strategically placed touch sensors inserted into the garments. Once certain body postures are detected, an audiovisual display is triggered on the other's garment. For example, if the male adjusts his tie or a female smoothes the fabric around her waist, an LED animation and melody play on the other's garment. The Skirteleon and the KineticDress belong to the Transfor-Me collection and address the desire of many people to transform themselves over the course the day. The Skirteleon skirt changes color and pattern according to the wearer's activities and mood: CuteCircuit engineered a new laminated fabric that changes color 'on-demand'. The Skirteleon might be blue in the morning when the wearer is at work, show a pattern with funny animal characters when the wearer is with friends, and then transform once more in the evening, showing a geometric, elegant Japanese pattern. The Victorian inspired KineticDress changes pattern when the wearer interacts with others or walks. The algorithm is designed to follow the pace of the wearer: a still pose when sitting alone shows a black dress, then when the wearer starts moving and interacting with others the dress slowly lights up with an animated pattern of blue-circles that creates a halo around the wearer. F+R Hugs is a shirt with embedded sensors that measure the strength of touch, skin warmth and heartbeat of one wearer, and sends the physical sensation of a hug across mobile telecommunication networks to actuators in the shirt of another wearer. Hugs could also be exchanged between people running the Hug Software in their mobile phones and the person wearing the Hug Shirt. The concept behind Wearable Synthesis is that modular clothing pieces can use input and output sensors, actuators and processors to communicate various signals, while preserving fashion's aesthetics. 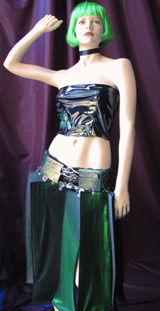 In one prototype, lights within an elegant skirt's pleats change color according to the user's body temperature, and also pulsate according to the pace at which the wearer walks. 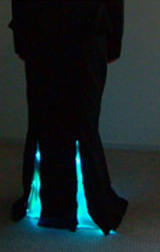 Lights on the back of a matching jacket also color shift in reaction to body temperature, and lights within the jacket project out when it is unzippered Several garments can be layered and will communicate amongst themselves, enabling a color-coordinated fashion statement. Wearable Synthesis also allows for ambient communication: one prototype garment lights up when its infrared sensors detects someone nearby wearing another prototype from the set. Dog@watch Kids-wear helps kids express their needs and feelings to their parents, allowing them to discover the world safely. Using Dog@watch, a kid can interactively express and share feelings such as 'sad', 'happy', 'sleepy', 'hungry', 'sorry', 'have a question', and 'want to talk'. Combined with GPS data and sensor alarm functions embedded in the belt of the watch, Dog@watch can be used to monitor and ensure the security of a child. Report-the-world Report-wear is primarily intended for professional reporters. Its trench coat styling and ample features support the modern nomadic life style. Ten cameras are attached to the coat to capture the surrounding environment: the wearer can choose any image to view in the head mounted display simply by selecting it with a dial attached to the coat. A ring-shaped speaker worn on the finger receives location-based audio data to assist with navigation. The e-Coaching Sports-wear prototype is designed for real-time health/exercise monitoring and personal coaching. Based on multiple readings obtained by individual sensors embedded in the outfit and sports watch (heart rate, temperature, UV, and acceleration), the system generates appropriate coaching messages such as “Let's warm up for 10 minutes' or 'Watch your motion, keep it steady'. Swarm is a community shared and avatar-driven mobile music device, featuring Mobile Social Music Software. The system is an on-body family of devices making a personal-area-network for gesture recognition and ad-hoc shared music listening. The “sensor subsystem” detects wearers' gestures while they listen to music. “The Malleable Music Terminal” is a paperback-book sized device with 1GHz processor and touchscreen that displays any friends from the user's buddy list within ad-hoc wireless range. These are the SWARM avatars: friends log into the system to listen and sculpt a common stream of music together. The system uses miniaturized force sensing resistors, accelerometers, and gyroscopes to pick up grip pressure and device movement as the user swings the device and taps along to the music. 'Scent Whisper' is a jewelry set that dispenses fragrances in response to a humidity sensor. The two brooches are inspired by spiders and the defense mechanism in bombardier beetles. This project uses wireless technology to link a remote sensor (a spider) with a fragrance-dispensing unit (a beetle). The wearer of the spider whispers a message into it, to be 'scent by a wireless web' to the beetle, worn by an admirer: the spider's humidity sensor records the temperature of the breath and releases scent from the beetle accordingly. The 'Smart Second Skin' dress mimics the human body, in particular the circulation and nervous systems, senses and scent glands. The dress responds to human emotions with fragrances that are diffused depending on the moods of the wearer. The dress can send aromatic 'messages,' and also promotes the wearer's wellbeing through olfaction stimulation: to reduce stress, transform negative moods, aid sleep, boost confidence, and expand the imagination. 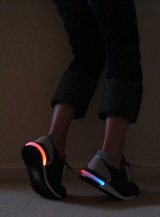 UFOS are sneakers modified to include an illuminated rear 'bumper.' Embedded circuitry senses each foot's motion in 3-D space, and generates a pulsing gradient of glowing color that shifts with each movement. Each wearer will have a unique pattern of colors based on their individual stride. Lumiloop is a modular system of program and display panels that can be chained together to form a reactive bracelet. Each display module features a small LED matrix, dynamically driven by an interchangeable program module. The program modules hold different display programs and include varying sensors for the bracelet to respond to: in one, an accelerometer interprets wrist gestures and generates illuminated patterns in response. The prototype Plexiglass shoes in the Reverie Engines collection include Electric Cinderella (designed for a woman who wants to intimidate intimadators) and The Beauty & the Beast (designed for an emotive woman who no longer wants to be a victim). With a single use stun gun embedded in the toe of one, and an audible alarm system activated by stamping the feet embedded in the other, these 'enchanted wearables' call up the woman's desire for empowerment and control over situations in her life. The project 'vestis: affective bodies' attempts to create a greater understanding of personal spaces. This first prototype has a structure of four tubular hoops circling the wearer's body, that expand and shrink independently. These telescoping movements create different body contours throughout the interaction between participants and the wearer, shrinking the hoops when the wearer comes closer to others, and expanding them when she moves away. A microcontroller defines these movements based on input from embedded proximity sensors. The project visually demonstrates an individual's physical comfort zone, and plays in a poetic way with the visual and tactile experience of embodied spaces, evoking participant engagement in a negotiation of personal space. OAKLEY THUMP™ is the world's first digital music eyewear: high-performance optics forged with an integrated, state-of-the-art digital audio engine to listen to music virtually anywhere. OAKLEY THUMP comes in six color combinations and two types: 256 MB and 512 MB versions. A High-Speed USB connection transfers music quickly and easily. The eyewear stores about 8 hours of music, delivered without cables or wires, and weighs only 1.8 ounces (52 grams) - lighter than an empty CD case. Durable, solid-state memory provides skip-free music, and with no hard disk to drain power the internal rechargeable battery lasts up to six hours. <exhale: breath between bodies> is a new collection of body area networked garments. Building on last year's collection of responsive skirts with muscle sensors embedded in garter belts, this year they feature sensuous networked skirts and sleeves linked with elastic breast-bands that listen to the wearer's breath. Made of natural silk & organza fibers in earthy and vibrant tones, <exhale> creates a shared public space of breath, revealing sensation, sound and light, exploring the notion of intimacy accessed through physiological data. <exhale> is also being featured in the Siggraph 2005 Emerging Technologies exhibition, as an installation that utilizes the collective breath of participants to actuate small fans and vibrators embedded with the linings of evocative skirts. If viewers negotiate a shared group breath, the skirts glow with light that palpates in rhythm with it. IN TOUCH - Interactive Performance Costuming is a novel pair of garments which are augmented with sensors and wireless transmitters that communicate with a remote computer to affect audio, visual, and/or light channels. Performance artists can interactively alter the look and sound of their performance through mutual contact: by making and breaking contact, they can remotely change visual and audio output in real time. IN TOUCH experiments with developing modes of physical-digital immersion and mediatized synesthesia via touch-based interfaces, inducing unstable states of awareness where physicality and virtuality can simultaneously co-exist. Skydeaminds, in conjunction with SmartLab, London, will showcase Skydeaminds Techno-kids Wear, a line of children's clothes using technology to enhance safety and comfort. 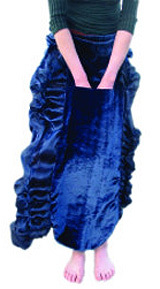 Inspired by Victorian pinafores and petticoats, these clothes reduce excess to essence, and include a high tech core. Location tracking and bio monitoring are designed as part of the garments: Body Media's Sensewear Pro Armband accompanies RFID technology to help keep kids of the future connected to vital bases of safety in a modern world fraught with potential dangers and extremes. SafetyNET/SMARTlab with BBC/UCD presents SMARTgloves & SafetyCorset (undercoverwire) by Bodkin Designs, with accessories by international fashion designers Fay Torez Yap and Daria Dorosh. 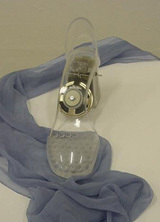 SafetyWEAR is designed for two purposes: to promote the project's work with a smart, fashionable line that women of all ages, sizes and backgrounds can comfortably wear; and to provide 'undercoverwire' wearable technology tools and triggers to connect to the SafetyNET online, without wearers being noticeable or audible while making their request for help. SafetyNET is a global cyber cafe project that uses the power of new technologies to help stop violence against women and children, quietly linking them to information about domestic violence through online access. In the "safe spaces" of moderated chat rooms, participants communicate with domestic violence specialists, volunteer attorneys, survivors of abuse, and mentors. The project is operating in North America, North Africa and throughout Europe. First phase installations are underway in Asia and Latin America. (presentation supported by Microsoft). Los Angeles based Nyx offers a new line of jackets with illuminated text or patterns that scroll across chest, arms, and back. Text is entered using a Palm Pilot device and beamed to the jacket display screens. A cell phone enabled Palm Pilot allows text messages, emails, and internet information to be downloaded right to the jacket. The screens are thin, flexible, and waterproof, so the jackets are lightweight and washable. They are powered by four rechargeable AA batteries stored in one pocket, which last up to eight hours. An embedded microphone provides a sound responsive function: environmental sounds can trigger various patterns that dance to the beat of the music. Jackets are expected to retail for a couple of hundred dollars sometime early next year. Other applications for the new technology are anticipated in the safety lighting, personal advertising, and entertainment industries. Sages is an elegant leather necklace enriched with a point of light as a jewel. It has three component layers: against the skin is enzymatic leather, in the middle is an electronic circuit, with an outer layer of translucent raw leather. The simple circuit includes a low-voltage yellow LED and a flat rechargeable battery. The metallic fastening also plays the role of switch: the LED turns on when Sages is worn, and turns off otherwise. The light enriches Sages with the values that it symbolizes: from intellectual enlightenment to emotional purity. Sages could be a recognition element for those who belong to the cyber-communities, fusing the ancient strength of the ornament with the omnipresent electronics of contemporary life. Femtechs are America's greatest weapon in the War Against Ravers, utilizing genetically altered firefly and chameleon DNA coupled with Mutel Obtanium processors for real-time glowing paisley pattern generation. Femtechs have a stunning graphical user interface and built in wireless connection to the galaxy wide web. Our industry standard processor bus and advanced open source operating system provide seamless connectivity and integration of disparate software into a common easy to use system that also supports field upgrades while preserving investments in legacy hardware. Standard Femtechs are equipped with tactical image targeting systems and Amazonian support suspension that will leave opposing forces begging to be assimilated. The Femtechs have an unprecedented ability to convert civilians into rockstars. Mutech Corp. Where Technology Grows. New work incorporates light sources beneath furs and sheer fabrics, and matches LED arrangement to the textile patterns. White corset dress consists of a corset top and ruffled skirt, made of asheer white fabric with a metallic holographic print. Internal multi-colored LED lighting illuminates the corset in a random twinkling pattern. Silver corset dress consists of a silver corset top with diagonal quilting detail and a straight full length silver metallic skirt. A grid of red, blue, green, and gold LEDs is embedded in the corset, and designed to fade and flash in a variety of patterns to suit your mood. Additional works include Color changing bodysuit, Faux fur coat with fiber optic lighting, and Gloves with lighted finger extensions. A little light is the perfect compliment to an outrageous outfit. Jim's whimsical “light enhanced accessories” have taken a slightly darker turn this year, into a realm reminiscent of Dr. Suess meets Tim Burton. His elegant gothic collar has a flower like quality in the way it wraps up around the head, and red LEDs at the ends of each stalk. His fire/ice LED heart can be triggered to fade from red to blue whenever you're feeling cold-hearted. Lighted elements are contrasted with industrial materials such as rubber and plastic, often scavanged by the artist from abandoned urban buildings. Best know for biomorphic latex bodywear that is endlessly reconfigurable, this fashion collective brings their new Binary Interlace Dress and Lotus Dress. In addition they bring several one off couture pieces in more tradional fabrics, including DEvan's Brown's elegant “Stellar”, a matched set for man and woman that seems to come from some distant time or place. SintheteX also creates the garments and accessories worn by Psymbiote, host of the fashion show. The designs of AMF Korsets reflect the mental oblivion of Louis Fleischauer, who takes the skins of cows and turns them into wearable creations. Born and raised in East Germany he is now living the American nightmare. He declared a war on fashion 12 years ago when he first started to work with leather. This progressive designer/sculpter/apocalyptic flesh explorer will present Recycled Skin Suit for the Days After Tomorrow and other corsets, skirts, face masks, and wings made of sculpted leather. This knife proof skin suit scares off any potential predetors that hide in the dark corners of the industrial waste land. Anissë unilizes transparent plastic, shiny chrome, geometric shapes, and electroluminescent accents to create a sensuous future couture. Psycho Gilrfriend is a design duo that specializes in creating unique wearable art pieces made from unusual and appropriated materials. The circuitry dress is aesthetic interpretation of the inner workings of computer systems, inspired by the beauty of the circiut board, and features a circiut board belt with LED accents. These exquisite stainless steel exoskeletons serve as costumes for this unique performance troupe. 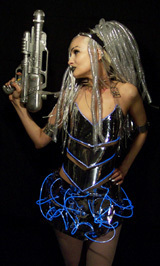 The CyberFashion afterparty will feature the complete show, on an elaborate set of custom instruments which trigger both light and sound when played. Autopsy Brooch, a piece inspired by stenography language that adheres directly to the surface of the skin via medical adhesive. “Mosquitos to the Vein”. 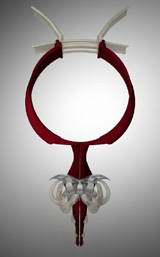 A large piece that clamps around the neck and hangs across the chest. During the SIGGRAPH convention, a “do-it-yourself” wearables workshop will be conducted by Katherine Moriwaki, Jonah Brucker-Cohen, and Ludica. A jury including the workshop team and CyberFashion producers will select the best project developed during the workshop, and present it on the runway. High resolution photographs of most everything listed above can be provided to the press on request.